Andrew has taught Church History, Christian Ethics, and Philosophy at QTC since 2008, and has served as our Vice-Principal since 2013. ​Andrew grew up in the Redlands east of Brisbane, and still loves the Bay; spending time there with family and friends whenever he gets the chance. 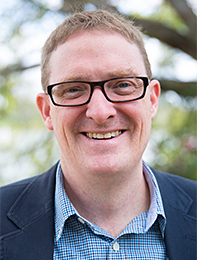 Prior to coming to QTC, he was a pastor on the NSW Central Coast, having previously spent five years with the Queensland Government working in economic policy and project management. Andrew completed first-class honours degrees in both history and theology from UQ and Moore Theological College, as well as Masters (Cambridge University) and PhD (UQ) degrees in history. His doctoral research was on how several of the Early Church Fathers understood the work of Christ. Andrew has also studied philosophy, completing a masters degree on Kant’s ethics at Macquarie, for which he was awarded the University Medal. He is keenly interested in developing and strengthening teaching and learning at QTC and beyond, among other things serving as Head of the Australian College of Theology’s (ACT) Department of Christian Thought & History and Chair of the ACT’S Coursework Committee. He has published in a range of areas in Christian ethics, historical theology, and adult education, including his recent volumes Passion and Resurrection Narratives: Post Nicene Latin Interpretations and Theological Education: Foundations, Practices and Future Directions (edited with Ian Hussey). He is married to Robyn, and they have two girls, Guinevere and Julia. Hear what Andrew has to say about his subject areas at QTC.